The frontrunner for Welsh Labour leader has said there should be a second referendum on Brexit if workers' rights are not protected. Two weeks ago, Mark Drakeford said it was "too early" to back a second vote, but wanted all options kept open. The finance secretary says he now backs a call by unions to keep alive the possibility of voters having the final say on the EU withdrawal terms. His leadership rivals have already backed a vote on the final deal. 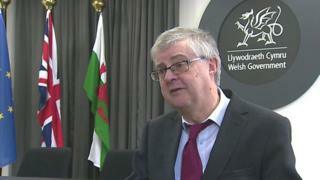 As finance secretary, Mr Drakeford is handling the Welsh Government's Brexit strategy. He is seen as the frontrunner to succeed Carwyn Jones, who steps down as first minister in December. In a statement, Mr Drakeford said he "wholeheartedly" supported the position taken by the Trades Union Congress (TUC) at its conference in Manchester on Sunday. Delegates voted to keep open the option of a public vote on the final Brexit deal. "In Wales we have always said, since the referendum, that all the rights that we've won through our membership of the European Union must be protected," he said in a statement. "If the Tories cannot deliver a Brexit which guarantees that will happen, then the people must decide." How would the UK hold a second EU referendum? It will be seen as a shift in position by Mr Drakeford at a time when there are growing calls from some quarters for the Labour Party to back a second referendum. Before the vote on Sunday, TUC general secretary Frances O'Grady said: "I want to serve notice to the prime minister today that if we don't get the deal that working people need, then the TUC will be throwing our full weight behind a campaign for a popular vote so that people get a say on whether that deal is good enough or not." Five Labour AMs have said they want to stand in the contest for Welsh Labour leader. Mr Drakeford and Health Secretary Vaughan Gething are the only ones with enough AMs backing them to make it onto the ballot paper. Alun Davies, Huw Irranca-Davies and Eluned Morgan have also said they want to stand but have yet to receive any nominations. Mr Gething said he was "the only candidate on the ballot paper to support a People's Vote in clear decisive terms" but hoped that position would change. "We should stand up and have the courage to do what we think is right for Wales," he said. "We should end the fudge, show some leadership and back a People's Vote now."